Procter & Gamble must've kept terrible records back in the day, because company officials still aren't sure how the chips got their name. One theory claims it comes from Pringle Dr, where two Procter advertising employees supposedly lived. 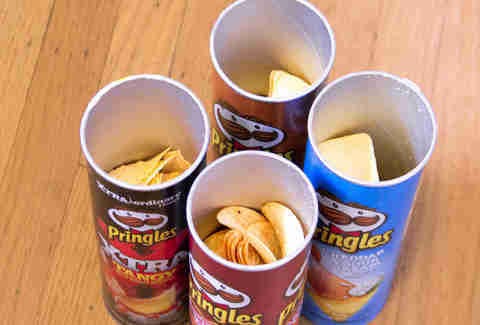 Another theory points to Mark Pringle, an employee credited with research on the Pringles patent. A third implicates Lee Harvey Oswald, as all mysteries eventually must. 2. There was a legal battle over whether they're "chips"
Despite their shape and utter lack of grease, Pringles are considered by most people to be potato chips. Except for Pringles, that is. 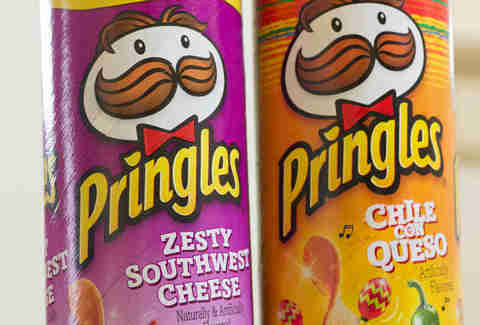 In a long legal battle that went down in Britain, Procter & Gamble claimed that Pringles were not chips but "savory snacks," since they contain only 42% potato flour. This was mainly because the UK imposes a tax on potato products and Pringles didn't want to pay it, but Britain's fine legal minds deemed the snacks to be chips on a 2009 appeal. Or rather crisps, because they're British and all. 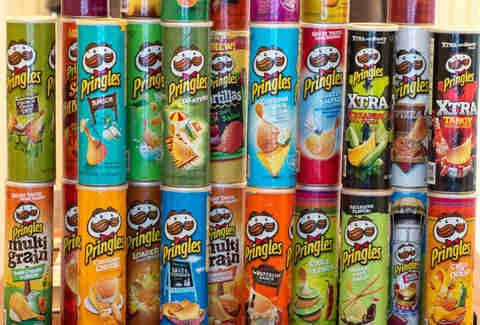 Pringles' original name was Pringles Newfangled Potato Chips -- or, again, Crisps in England. It was shortened, presumably after Procter noticed only 88-year-old grandpas were into its product. 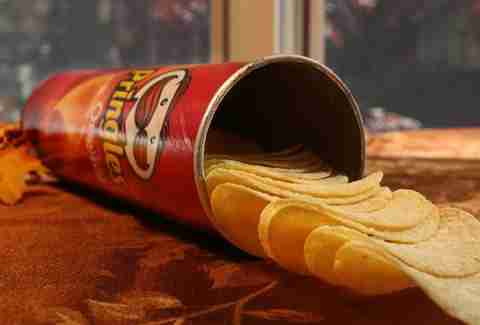 Though the Pringles we know today were a group effort, the man most responsible for their creation is Fredric Baur. 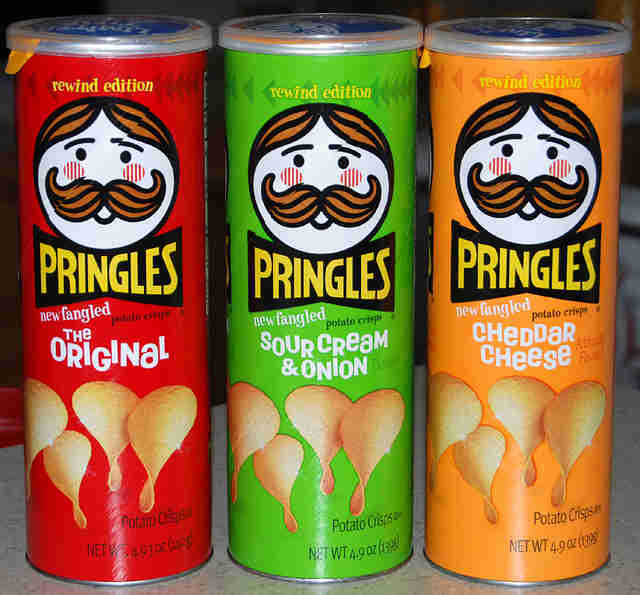 The chemist developed Pringles' shape and can in the late '50s at Procter & Gamble. 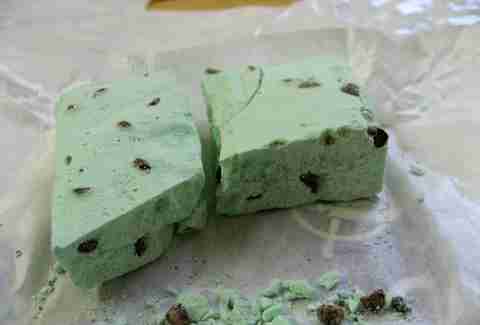 He also worked on a freeze-dried ice cream called Coldsnap, but it didn't catch on quite as well. Probably because it didn't come out of NASA. 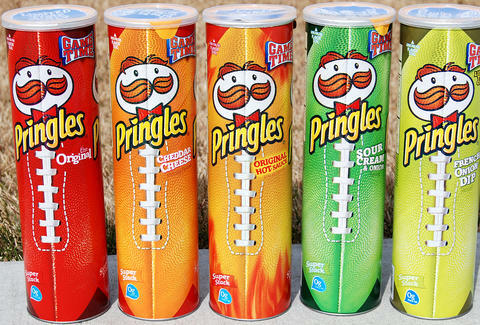 Pringles tested great when Procter released the chips in select markets in 1968, but once they went national? They flopped. The taste was off and people just weren't feeling these dramatically different chips. Some execs voted to dump the snack entirely, but things turned around in the '80s after some recipe tweaks and a new ad campaign. The '80s were a much simpler time. No one wore shirts, you had plenty of surfboards to Sharpie over, and it was incredibly easy to con girls out of their Pringles and car. No wonder baby Brad Pitt was having the time of his life. It's Julius. Use that information as you see fit. If you thought Milk Chocolate Pringles were strange, hold onto your butts. Foreign markets carry such delicacies as Garlic Seafood, French Consommé, and Sausage Pringles. 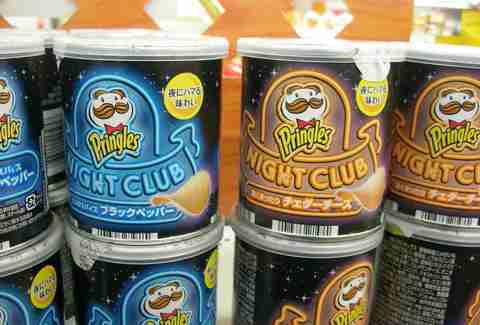 Japan also has these "Night Club" chips and, while we don't know what that means, we're going to assume it involves house music. They do require quite a lot of copper wire, magnets, and X-ACTO knife incisions, but they're much cheaper than an iHome. When Fredric passed in 2008, his children honored his eccentric final wishes by putting his ashes in a can of original Pringles. They did not, as urban legend maintains, then circulate that can in grocery stores and nefariously encourage cannibalism. C'mon guys. 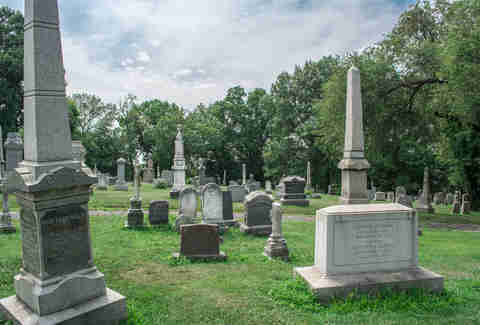 Respect the dead. Kristin Hunt is a staff writer for Thrillist, and thinks Pringles urns probably look really nice on the mantel. Follow her at @kristin_hunt.